I am happy to see that Scorpion summer collection adds two new women’s pieces to the mix with the Scorpion Maia Jacket and Pants - and they’re not pink, flowery or corseted! Replacing the afore-described Scorpion Women's Nip Tuck II Jacket, the Maia jacket stands as the ¾ length summer jacket option beside the popular sport-cut Verano, and the Maia pants add a more subtle summer pair of pants than the Savannah II’s already on the market. In thesis and conclusion, the Maia jacket and pants are a mixture of textile and mesh. OK - Any questions? In all seriousness, Scorpion has excelled at offering a simple, protective mesh/textile jacket and pant that does does not break the ceramic motorcycle-shaped piggy bank. 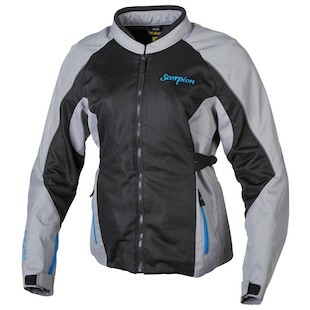 Featuring CE Level 2 Sas-Tec armor in the elbows and shoulders, the Scorpion Maia Jacket offers top-tier impact protection for women riders at a lower cost than the competition. The jacket also features 3 storage pockets, reflectivity on the back and shoulders, and adjustment straps to flatter the waist. The jacket also includes an 8’’ connection zipper and belt loop options for all those belt looped pants you might have. 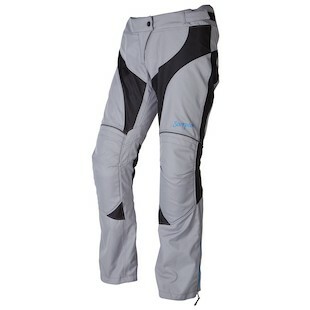 The Scorpion Maia Pants use the Sas Tec knee armor and include hip pockets for CE hip pads. With 600D poly impact areas for abrasion protection, and large poly-mesh panels everywhere else, these pants will keep you both cool and confidently safe. They also feature an 8’’ connection zipper to connect the matching jacket. Reflective piping adds to the visibility, which is important for the muted color scheme. The jacket and pants are available in two color combos - the LBS or “Little Black Suit” as I like to call it, or the “Couple-Shades-of-Grey”, with attractive blue accents and black panelling. Both feature full removable windproof liners for those chilly Summer Nights (tell me more, tell me more) and accordion gussets for a tailored, comfortable women’s fit. I personally have had my mesh/textile Verano predecessor (Read: ancestor) for several years now and it has held up marvelously for the reasonable investment. By supplementing their basic textile/mesh options with beefier impact protection and longer coverage in the torso, this jacket is a win for the coin purse, wallet, clutch, bag-with-a-dollar-sign, or however you choose to carry your dollars. In summation, Scorpion has done well in envisioning, crafting, and producing a great warm-weather set of riding gear for female motorcyclists in search of a feature-rich touring option that will stand up to the rigors of the road over time.